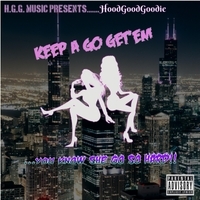 Raw, un-cut and feisty, "Keep A Go Get'EM" is a song filled with lyrics challenging male counterparts to recognize the one who holds them down through thick and thin. With Feelings of pride that's priceless, you get songs intended to Empower women regardless of how the message is delivered!! "It's all a test and I be damn if I let these Devils catch me slipping ya dig"